Don Brang has been involved in the Syracuse area as a businessperson and entrepreneur for the past 55 years. During the mid fifties, Don started out mowing residential lawns and shoveling driveways to support himself during his school years. By the end of high school, the mowing business evolved into a more elaborate landscape business concentrating on the installation of landscape materials for residential and commercial clients. Working with landscape architects and designers offered Don the knowledge and expertise required to do larger projects. The large demand for landscape products in the commercial landscape business prompted the opening of “Brang Garden and Nursery” in the early sixties. The nursery store allowed Don access and control of landscape materials required for large projects and allowed Don to expand into the site construction business. The Garden and Nursery store was eventually sold in the early eighties. With the formation of the site construction business, Brang Company Inc. became the preferred contractor for various municipal projects throughout Central New York. Over the next two decades, Brang Company Inc. completed various types of municipal projects including the installation of over 150 parks and recreation facilities, the execution of the City of Syracuse’s sidewalk rehab and planting project, boat launches, and break walls. Brang Company Inc. led many private projects including the installation of soccer fields, football fields, tennis courts, running tracks, sanitary sewer installations, subdivision infrastructure installation, parking lots, and other large site work projects. Brang Company Inc. also became the prime approved contractor for CSX Rail Road, performing all types of property maintenance. Utilizing his site construction and general contracting knowledge, Don Brang formulated the largest commercial snow plowing and snow removal business in Central New York. For over 35 years, Brang Company Inc. was responsible for a number of municipal and private snow removal contracts. Brang Company Inc. introduced the first 35’ long plow blade for loaders and the first folding 16’ long blade for pick-up trucks. Brang later introduced larger blades and innovative blade designs. LINK TO PHOTOS The introduction of this technology revolutionized the manner in which the Brang Company and the entire snow removal industry approached and completed projects. The efficiency and cost saving methods provided Brang Company with an unparalleled reputation of innovation, expertise, service and quality detail. Brang Company Inc. serviced and retained these contracts until the business was sold in 2000. Over the years, the continued expansion of the site construction, general contracting and snow removal business required the acquisition of commercial facilities. Throughout the late eighties and nineties, Don Brang leased his existing properties while acquiring new facilities to house his growing business. In addition to his personal business properties, Don was able to purchase and develop additional properties for lease or sale. 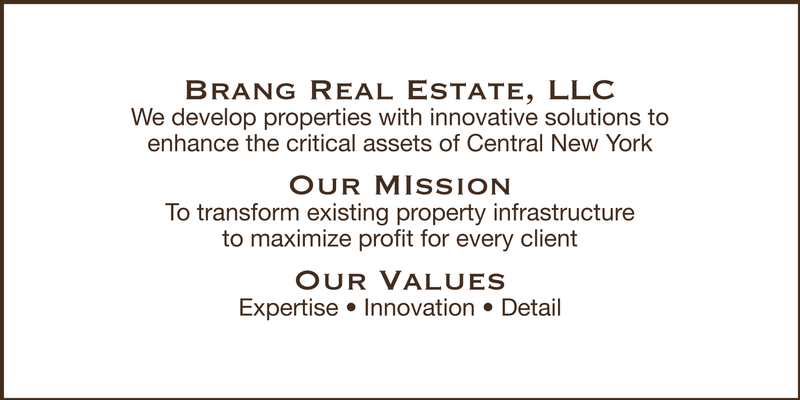 Brang’s Real Estate Division built a commercial real estate portfolio servicing a variety of businesses and industries. In addition to his community business endeavors, Don’s years of passion for flying eventually provided business opportunities. In 1996 Don founded the first helicopter training school in Syracuse (BAIR Helicopters, LLC). LINK TO PHOTOS The school was located at Hancock International Airport and trained students to become certified helicopter pilots. Some of the graduating students went on to become Air Guard Fire fighters and public/private helicopter pilots. Bair Helicopters also created signature business opportunities here in Central New York. In 1998, Jim Bra ng formulated Brang Real Estate, LLC, a Licensed Real Estate Broker, which is responsible for the selection, acquisition, development, leasing, managing, and sale of commercial real estate properties. With the new direction in commercial real estate, Brang Company Inc. transitioned from site contractors/general contractors into a Developer/Property Maintenance Company. With the growth and development of the Brang real estate portfolio, coupled with the decline of industry in the area, Don and Jim recognized the potential for developing large vacant industrial properties with a multi-tenant development concept. The combination of Brang Real Estate portfolio and Brang Company Inc.’s experience enabled the Brangs to create a niche market, becoming one of the largest commercial real estate owner/operators in the area. The Brang Family remains committed to the pursuit of development opportunities with lasting effects on our community.